3 XL vials of Gold Flakes 35mm x 15mm glass bottles with cork. New Larger Size! Details about 3 NEW Large SIZE vials of Gold Leaf/Flakes 32mm x 14mm glass vial with cork. 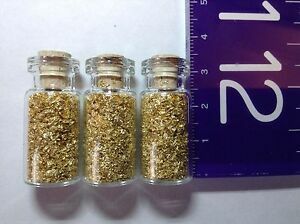 3 NEW Large SIZE vials of Gold Leaf/Flakes 32mm x 14mm glass vial with cork.